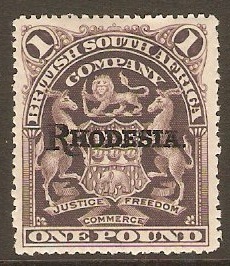 Rhodesia 1892 1d Black. SG1. Used 1892 1d Black. SG1. Rhodesia 1892 6d Deep blue. SG3. Mounted mint 1892 6d Deep blue. SG3. 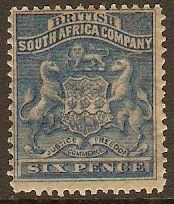 Rhodesia 1892 ½d Deep blue and vermilion. SG19. Fine used 1892 ½d Deep blue and vermilion. SG19. Rhodesia 1892 2d Deep dull green and vermilion. SG20. Mounted mint 1892 2d Deep dull green and vermilion. SG20. 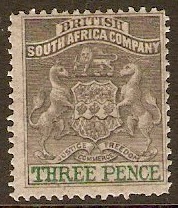 Rhodesia 1892 3d Grey-black and green. SG21. 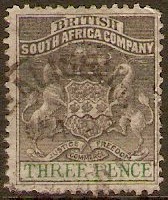 Used 1892 3d Grey-black and green. SG21. 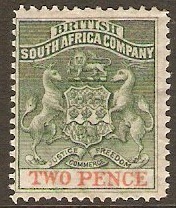 Mounted mint 1892 3d Grey-black and green. SG21. 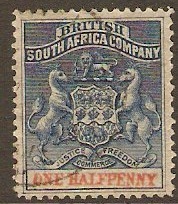 Rhodesia 1892 4d Chestnut and black. SG22. Some damage 1892 4d Chestnut and black. SG22. Crease across top r/h corner. 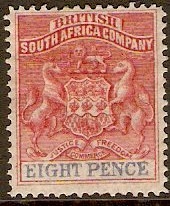 Rhodesia 1892 8d Rose-lake and ultramarine. SG23. Heavy mounted mint 1892 8d Rose-lake and ultramarine. SG23. 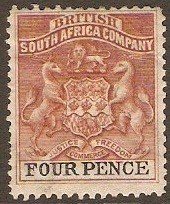 Rhodesia 1896 6d Mauve and pink. SG33. 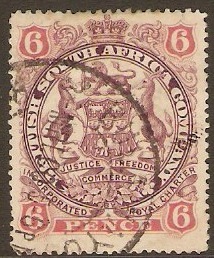 Used 1896 6d Mauve and pink. SG33. 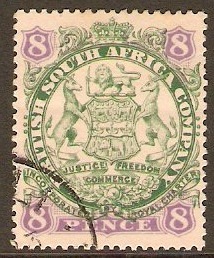 Rhodesia 1896 8d Green and mauve on buff. SG34. 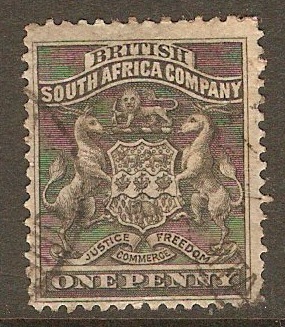 Used 1896 8d Green and mauve on buff. SG34.